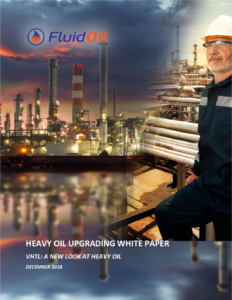 VHTL White Paper – FluidOil Corp. Global demand for crude oil and liquid fuels creates an opportunity for the exploitation of heavy oil resources. Many of these resources exist in the form of stranded assets, which tend to be geographically remote or difficult to access. In these locations, industrial infrastructure has not necessarily matured or the availability of construction resources is extremely constrained. In addition, production techniques continue to become ever more complex. As a result, the development of heavy oil remains economically challenged and deployment of conventional solutions to solve these challenges can be impractical. However, because of the global abundance of heavy oil deposits and depleting conventional oil supplies, heavy oil is becoming an increasingly important global hydrocarbon resource. A viable economic solution is required to address the challenges of heavy oil. View or download our white paper here.